Irish cuisine conjures up images of cosy pubs, warming pies, and heady pints of Guinness—it’s the ultimate comfort food, and sure to cure any hunger pain, no matter how intense. With great flight connections to Dublin with Emirates, via a quick stop in Dubai, we’ve been considering our very own trip to the land of Leprechauns—and until then, we’ve tracked down the best Irish dishes in Australia to keep our travel pangs at bay. From whiskey to roasts, to epic pub grub, and potato with everything, here are the country’s best Irish eats. After a traditional Irish whiskey? 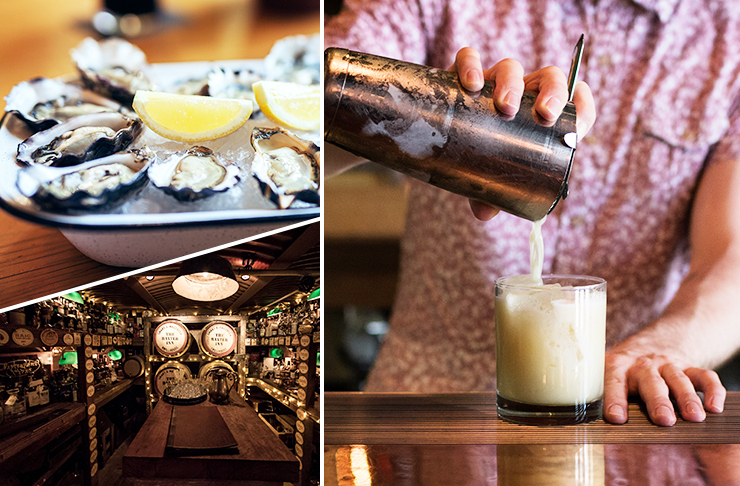 Brisbane’s perfectly dark and warming whiskey bar, Cobbler, is the ideal spot to sample some firewater. With over 400 whiskies on the menu, you can rest assured your whiskey needs will be well and truly met. Best of all, they’re BYO food, so you can ship in your own steak and Guinness pies for a truly Irish night out. Also in the market area, The Drunken Poet is a more low-key Irish pub that delivers on live traditional Celtic music, trivia nights and a mighty beer and cider list. Drop by and make friends with the locals over a Guinness and a packet of Tayto crisps! With a fantastic whiskey selection (as well as a great list of whisky, the Scottish spirit, too), The Baxter Inn basement bar will make you feel like you’re stepping into a Dublin speakeasy during prohibition. Bars that come with sausage rolls are always good in our books, and at The Wild Rover, that’s exactly what you’ll get. The Irish bar steers well clear of the tacky shamrock-covered variety and instead celebrates more refined Irish drinking moments. Nobody does St Patrick’s Day like the Dan O’Connell, who usually start the celebrations with a traditional Irish Fry on 17th March each year. Take the day off work and join in the festivities for an annual hit of Irish culture. Slainte! Situated a stones’ throw from the Queen Victoria Market, The Last Jar is one of Melbourne’s best Irish pubs for delicious drinks, top quality traditional food and a slice of Irish culture. 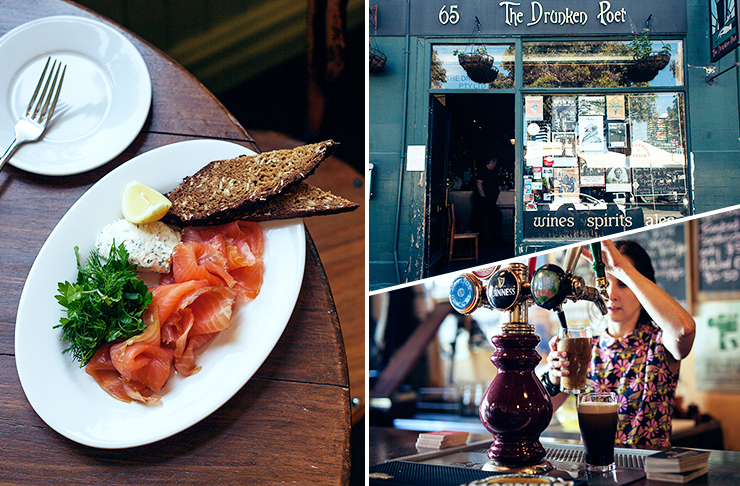 They churn their own butter and cure their own fish, making for a fantastically indulgent pub sesh that’ll prep your arteries for Dublin. With a Dublin born chef at the helm, Four In Hand has all the charm of a cosy pub, with a world-class menu ideal for sampling over a long lazy lunch. Bringing together the best in hearty European cuisine, you’ll find roasts, corned beef, and Colcannon (a traditional Irish potato and cabbage dish) and more on the menu here, all of which you’ll find on the Emerald Isle, too. While it might not be the swankiest of venues, The Irish Times does a cracking Guinness glazed burger as well as a healthy dose of Irish culture. The perfect place to perfect your Irish accent over a patty feast. While it’s technically an English pub, Lord Dudley pulls one of the best pints of Guinness in Sydney, as well as serving up some epic roasts and pies that will prep you for eating in Ireland’s colder climate. A must for gathering your mates and digging into an Irish feast! Potato and leek soup is an Irish staple, and the Tognini’s team make some of the best in the city! Pair it with some freshly baked soda (if you can find it) and you’ll be in for a Celtic foodie treat.